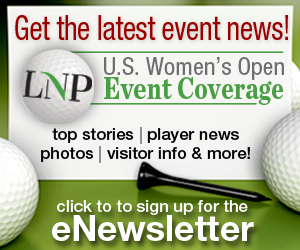 Inbee Park takes questions during a press conference at the 2015 U.S. Women’s Open Friday. Mike Trostel interviews Jane Park after she finished her second round of the U.S. Women’s Open at Lancaster Country Club Friday. Min Lee hits from #9 at Lancaster Country Club in the second round of the 2015 U.S. Women’s Open. Lexi Thompson tees off from #1 at Lancaster Country Club Friday morning to start her second round of th2015 U.S. Women’s Open.